Executive Chef Rainer Sigg of the Restaurant Baltschug at the Hotel Baltschug Kempinski shares an exciting taste of Russia with his delectable four-course dinner. Chef Sigg is a shining star among chefs. His impressive career includes working at the Hotel Colombi in Freiburg, Germany, the Fürtenhof hotel in Landshut, three years at the legendary Aubergine working with star Chef Eckart Witzigmann in Munich as the Deputy Head Chef, and six years as Chef de Cuisine and Restaurateur at the Michelin-rated Top Air restaurant in Stuttgart. In July 2002, he joined the illustrious Hotel Adlon in Berlin, Germany. I first met Chef Sigg in 2004 at the Hotel Adlon where he obtained a Michelin-star for their restaurant Lorenz Adlon. 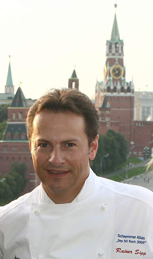 His many awards include the Star Diamond Award as "One of the Finest Chefs Worldwide" from The American Academy of Hospitality Sciences in 2003, 2004, and 2005, one of the "Top Chefs in Germany" in 2004 and 2005 from the Aral Schlemmer Atlas, and is listed as one of the 100 best chefs in Europe. In June 2005, Chef Sigg joined the stunning Hotel Baltschug Kempinski as Executive Chef where he excels at his philosophy that "Cooking should be a work of art." After experiencing Chef Sigg's culinary artistry, I readily concur with his belief that, "At the end of my day, I like it when the guest is happy." I know that I was. He has cooked for international heads-of-state as well as celebrities including former Bundeskanzler Gerhard Schroeder, former United States President Bill Clinton and his wife Hillary, former Soviet leader Mikhail Gorbachev, the musician Bryan Adams, and the actor Pierce Brosnan. In November 2006, Chef Sigg stopped long enough for an interview and to share a few of his culinary secrets with me. No, I will not tell you his culinary secrets, some secrets I keep all to myself. He has worked with some of the most celebrated chefs in the culinary world including creating extravaganza dinners at the Hotel Baltschug Kempinski with Master Chef Paul Bocuse and Three Star Michelin Chef Joachim Wissler. 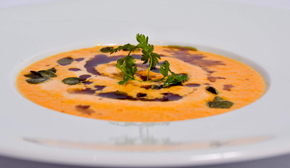 He is a chef that is always looking for the perfect ingredients for the Restaurant Baltschug with its French and international cuisine combined with a little fusion to create interesting tastes of the world. When asked about culinary trends for the future, he replied that "It is not so easy to say what is coming for the future, but at the moment, learning more about quality products and cooking styles, using fresh products and concentrating on interesting flavors and food that is not too heavy. After a four or six course menu, you can feel well and remember the taste. There are many hobby chefs now that enjoy cooking for their friends in their home kitchens, and when they go to restaurants, they know what they like. 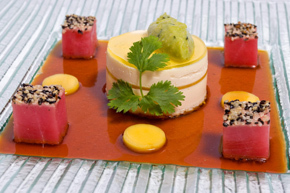 Chefs need to work to create new and interesting things for them to experience." When not creating new recipes, he enjoys riding his Honda CVR 1000 motorcycle, traveling, skiing in winter, rollerblading, and his new hobby, golfing. Although it would be wonderful to immediately spirit off to the Hotel Baltschug Kempinski to sample Executive Chef Rainer Sigg's creative cuisine, until you can travel there, you can be inspired with his recipes. 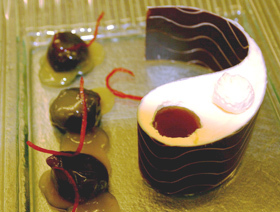 This decadent four-course menu is from the Gastronomic Festival "100 Best Moscow Restaurants" created by Executive Chef Rainer Sigg, that I had the extreme pleasure of enjoying during my stay at the hotel in November 2006. Sauté vegetables in clarified butter until the vegetables appear translucent. Add the peppercorns, bay leaves, and remaining ingredients. Cook over low heat for 20 minutes and then remove from heat. Pass the mixture through a chinoise and let cool. Mousse mixture must be cold and have the consistency of cold cream. Simmer the mousse mixture and add the gelatin sheets that have been soaked in water. Add the cream and combine. Cool the mixture. Bring the fish stock to a low simmer, and then add saffron and the gelatin sheets soaked in water. Set aside. Combine all of the ingredients and let sit at room temperature. Fill each of the (10) molds with the bread and then the mousse. Let chill in the refrigerator for 30 minutes. Add a thin layer of the jelly and then let chill in the refrigerator for another 30 minutes. Repeat this step with the mousse and the jelly once more, and then refrigerate overnight. To serve: garnish the Chartreuse with guacamole and coriander leaves. Place the tuna sashimi on the plate; garnish the plate with sliced mango and soy sauce. In a large pan, sauté the onions and peppers in butter until they become translucent. Add the chopped pumpkin and continue to sauté for 10 minutes. Add the chicken stock and continue to cook until the pumpkin is soft. Add the cream and allow the soup to thicken. Puree the soup in a blender and finish through a sieve. For the presentation: garnish with roasted pumpkin seeds, chervil, and a drizzle of pumpkin oil. Sear the beef filets, and blanch the spinach. Remove any remaining liquid from the spinach with a kitchen towel. Combine all ingredients in a food processor and then run through a fine sieve. Boil the parsnips and run through a ricer. Combine in a pan with milk and butter. Sprinkle with nutmeg before serving. Heat the veal sauce and add finely chopped truffle on the plate. First, wrap the filet in farce in spinach, then the foie gras in farce and spinach. Spread a thin layer of farce over the filet and stack the foie gras over the beef filet. Finally, wrap the entire package in farce and spinach and then place between two sheets of puff pastry. Cut into discs. Bake in a pre-heated oven at 180 degrees Celsius (350 degree Fahrenheit) for 12 minutes. Let rest and cut in half. One pastry serves two people. 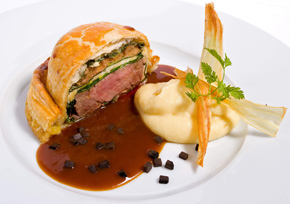 Serve with the parsnip puree and truffle sauce. In a double boiler, beat the eggs and sugar at 90 degrees Celsius (194 degrees Fahrenheit), and then fold in the honey. Place the bowl over an ice bath while constantly whipping the mixture, add the heavy cream and continue to whip. Place the mixture in the chocolate tuilles and freeze overnight. Serve with Armagnac prunes and garnish with grenadine orange zest. Combine all of the ingredients, and place the prunes in the mixture overnight to infuse. Peel the oranges and cut the peel into strips. Prepare three pans: one with boiling water, one iced water bath, and one with the simple syrup and grenadine. First, blanch the orange zest and shock in the ice bath, and repeat. Then, place the zest in the syrup mixture for one day to infuse.